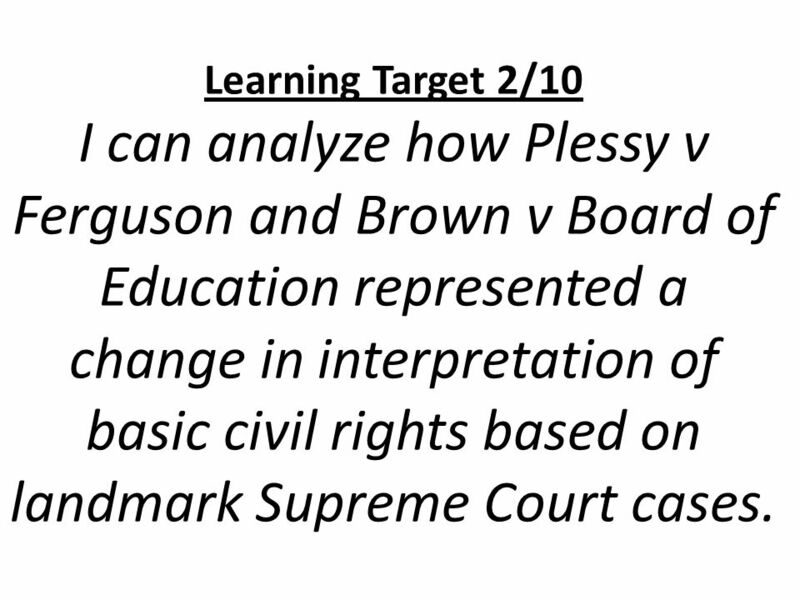 1 Learning Target 2/10 I can analyze how Plessy v Ferguson and Brown v Board of Education represented a change in interpretation of basic civil rights based on landmark Supreme Court cases. 2 Warm up 1. Why is the struggle for equality ongoing? 2. 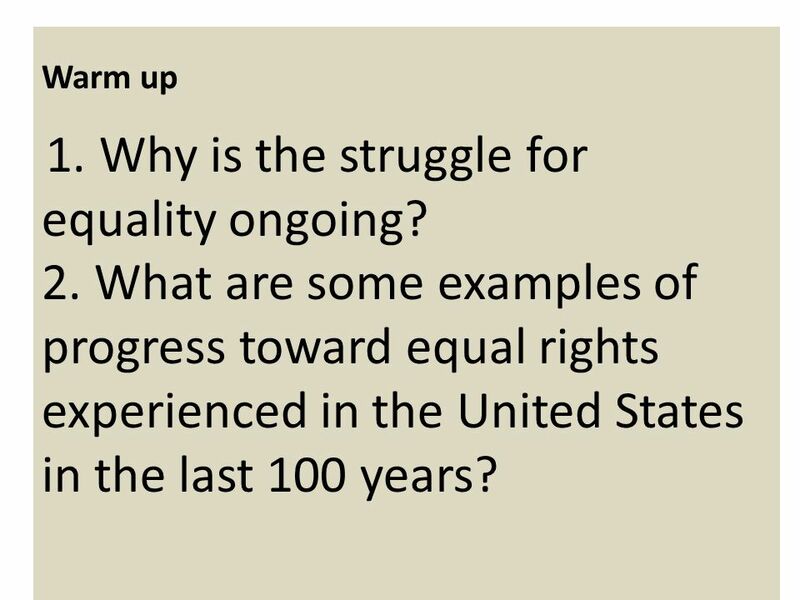 What are some examples of progress toward equal rights experienced in the United States in the last 100 years? 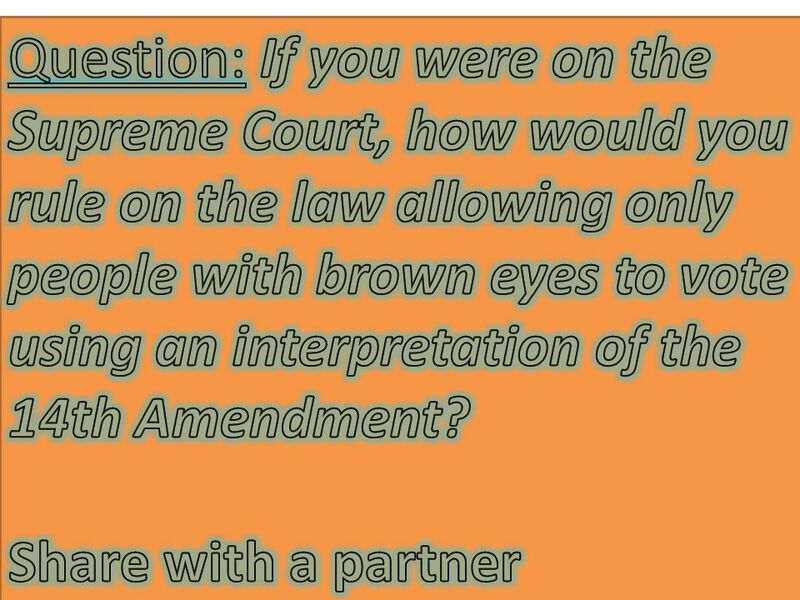 3 Share with a partner how you would feel about this law. 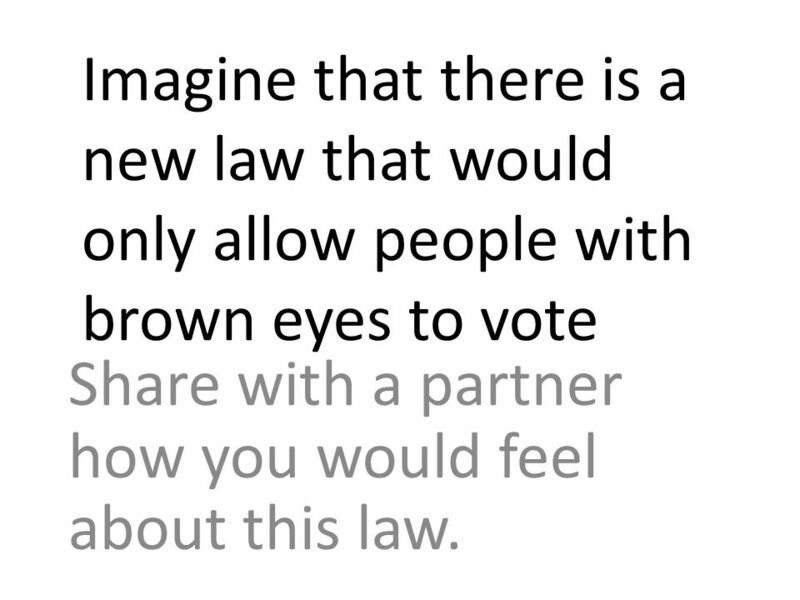 Imagine that there is a new law that would only allow people with brown eyes to vote Share with a partner how you would feel about this law. 4 14th Amendment No State shall make or enforce any law which shall abridge the privileges or immunities of citizens of the United States; nor shall any State deprive any person of life, liberty, or property, without due process of law; nor deny to any person within its jurisdiction the equal protection of the laws. 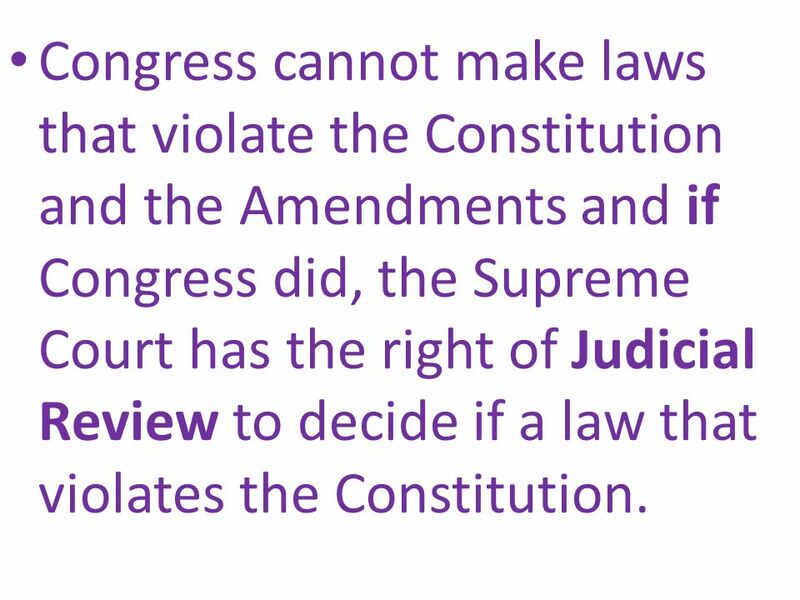 5 Congress cannot make laws that violate the Constitution and the Amendments and if Congress did, the Supreme Court has the right of Judicial Review to decide if a law that violates the Constitution. 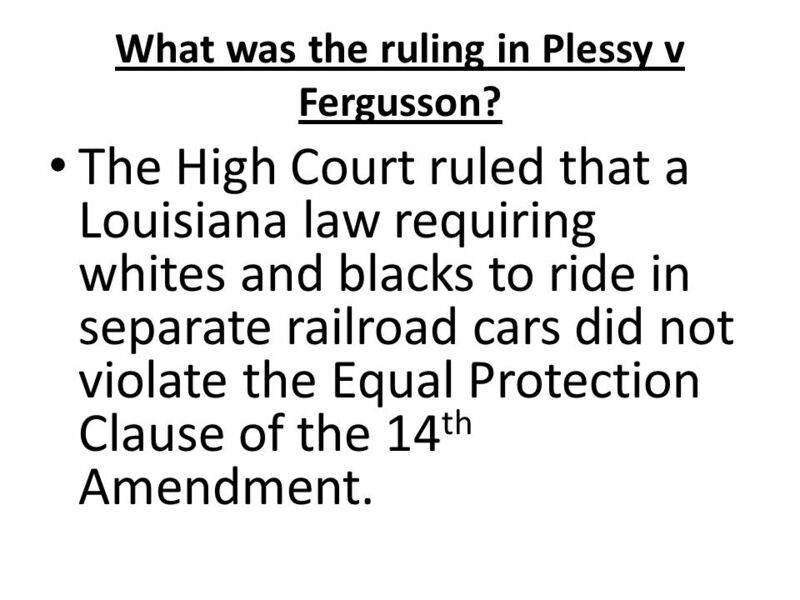 8 What was the ruling in Plessy v Fergusson? The High Court ruled that a Louisiana law requiring whites and blacks to ride in separate railroad cars did not violate the Equal Protection Clause of the 14th Amendment. 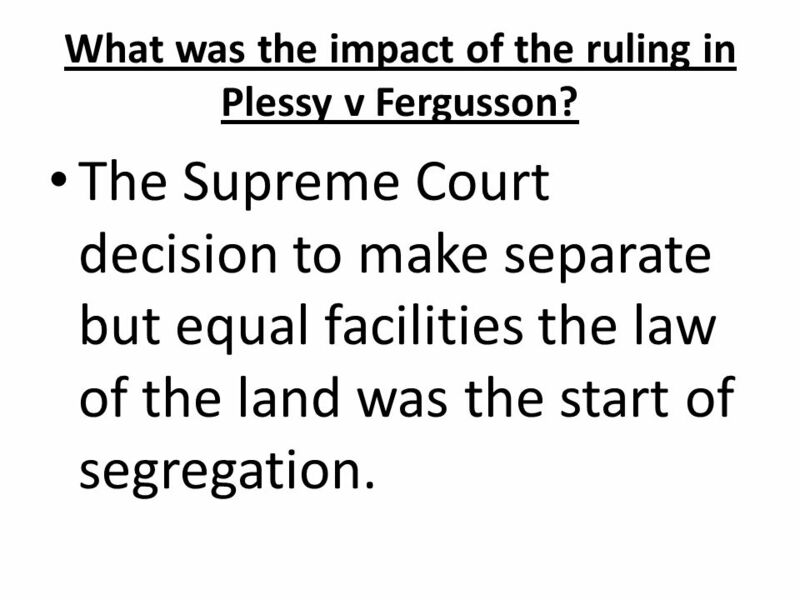 9 What was the impact of the ruling in Plessy v Fergusson? 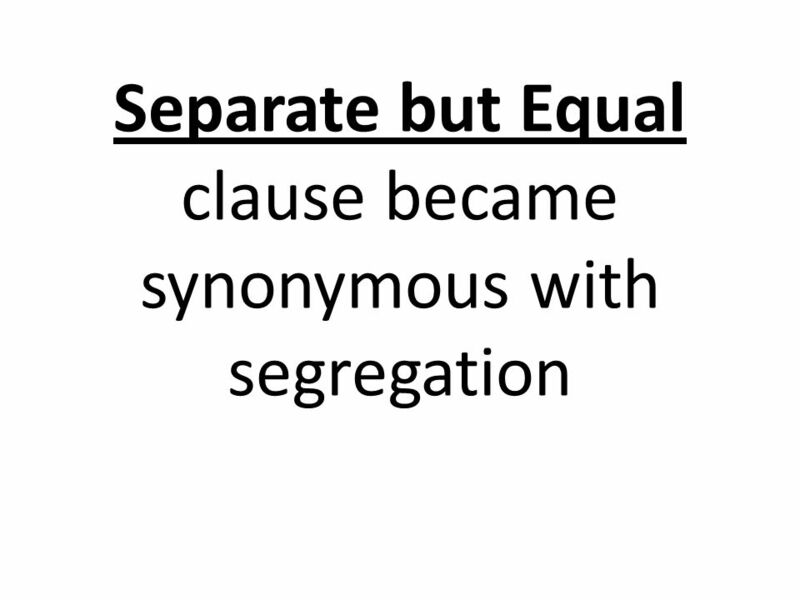 The Supreme Court decision to make separate but equal facilities the law of the land was the start of segregation. 12 Legislation is powerless to eradicate racial instincts or to abolish distinctions based upon physical differences.... If the civil and political right of both races be equal, one cannot be inferior to the other civilly or politically. 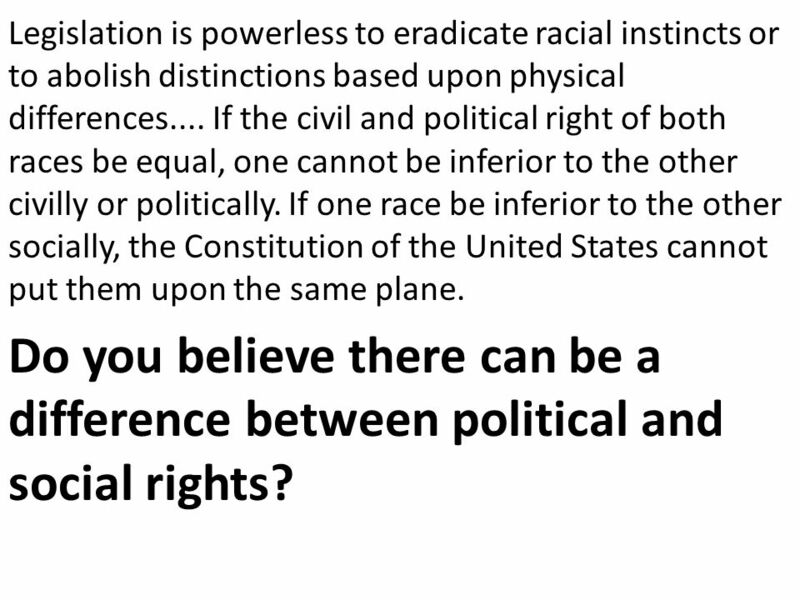 If one race be inferior to the other socially, the Constitution of the United States cannot put them upon the same plane. Do you believe there can be a difference between political and social rights? 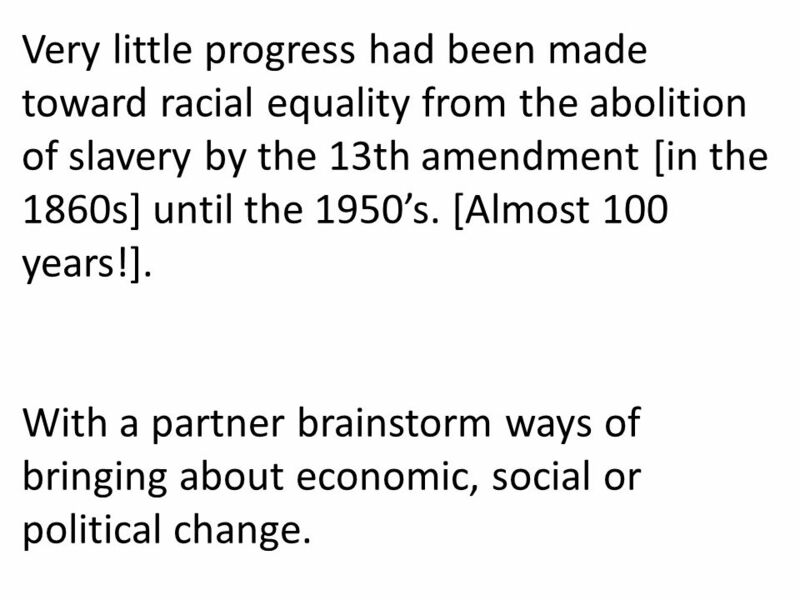 13 Very little progress had been made toward racial equality from the abolition of slavery by the 13th amendment [in the 1860s] until the 1950’s. [Almost 100 years!]. With a partner brainstorm ways of bringing about economic, social or political change. 1. Were the actions of Linda Brown’s family and Thurgood Marshall a form of protest? Why/Why not? 2. 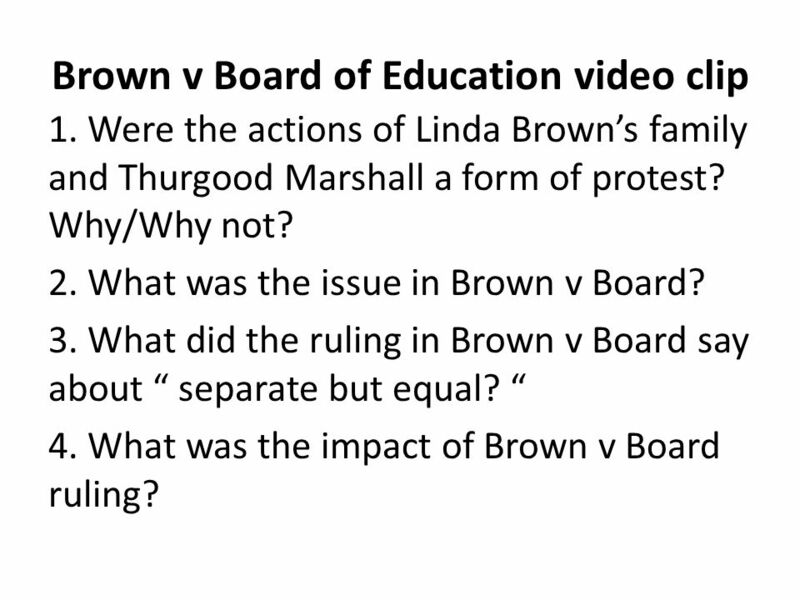 What was the issue in Brown v Board? 3. 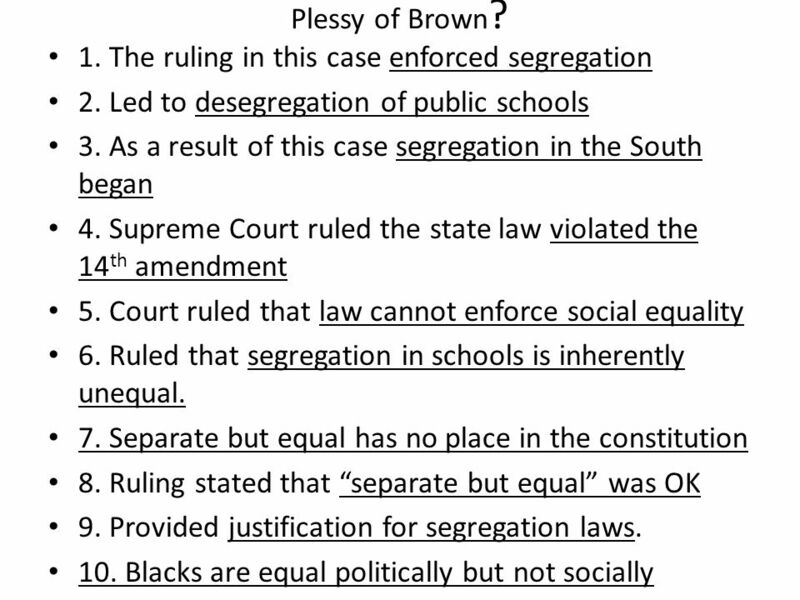 What did the ruling in Brown v Board say about “ separate but equal? “ 4. What was the impact of Brown v Board ruling? 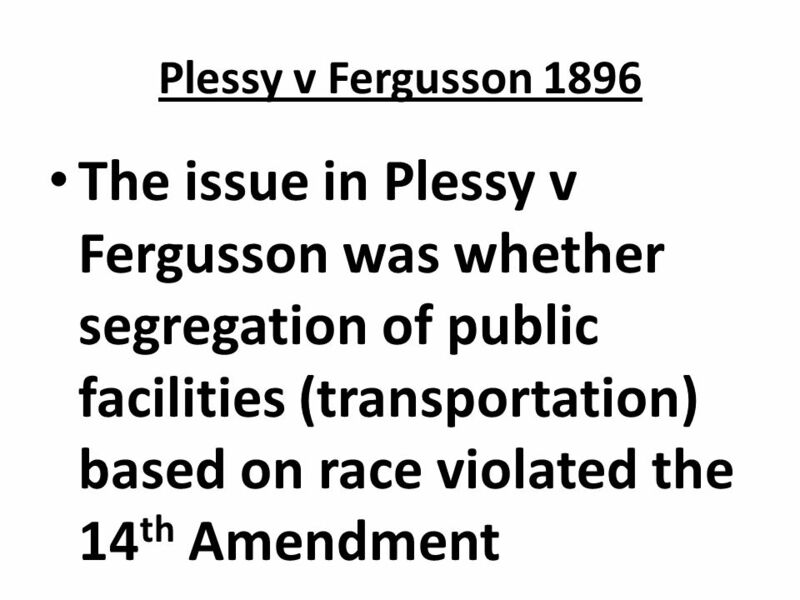 The ruling in Plessy v Ferguson said that segregation did/didn’t violate the 14th amendment and “separate but equal” was acceptable/not acceptable. 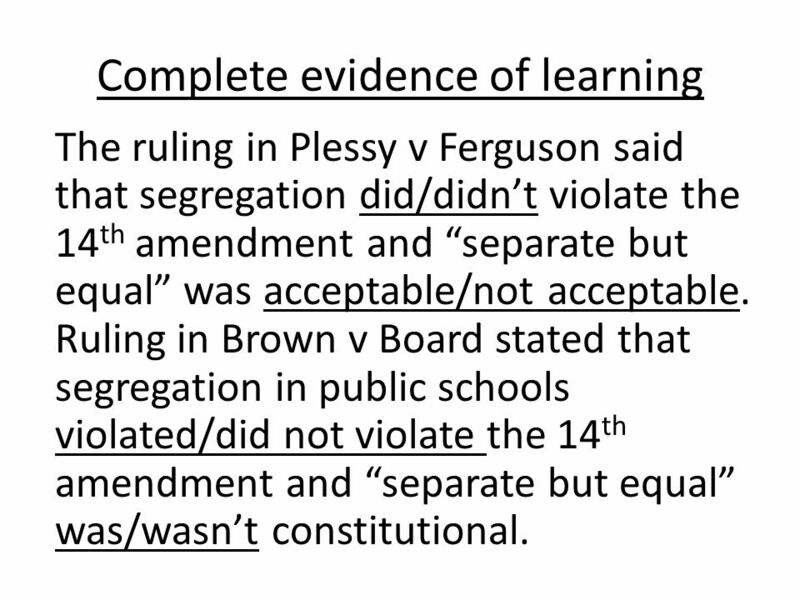 Ruling in Brown v Board stated that segregation in public schools violated/did not violate the 14th amendment and “separate but equal” was/wasn’t constitutional. 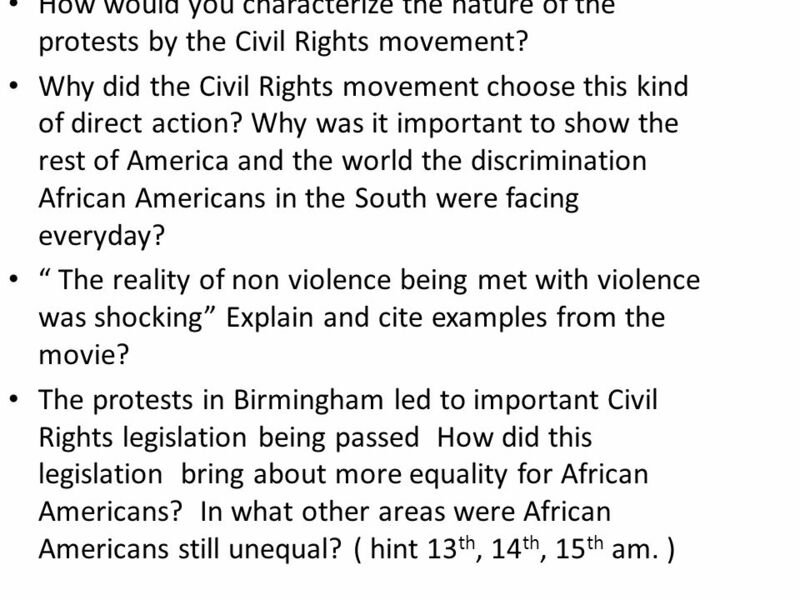 17 How would you characterize the nature of the protests by the Civil Rights movement? 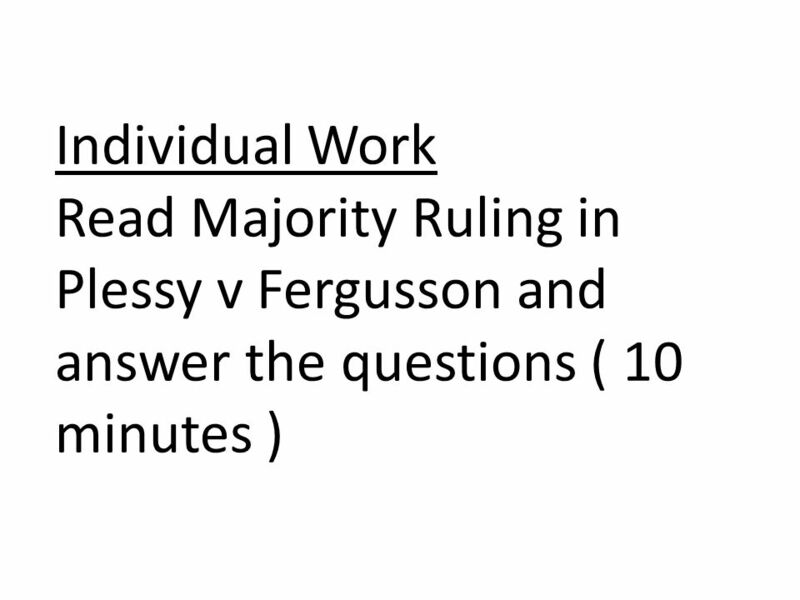 Download ppt "Learning Target 2/10 I can analyze how Plessy v Ferguson and Brown v Board of Education represented a change in interpretation of basic civil rights based." (1896), is a landmark United States Supreme Court decision in the jurisprudence of the United States, upholding the constitutionality of state laws requiring.  Was a landmark decision of the supreme court of the U.S.A. concerning racial segregation. Everything You Need To Know About The 13 th – 15 th Amendments To Succeed In APUSH Period 5: 1844 – 1877 Shoutouts to Alyssa S., Sophia. SS8H7b TSW evaluate key political, social, and economic changes that occurred in Georgia between 1877 and b. Analyze how rights were denied to African. Civil Rights Intro A Legal Background. Reconstruction Amendments. Legal Background of Civil Rights. 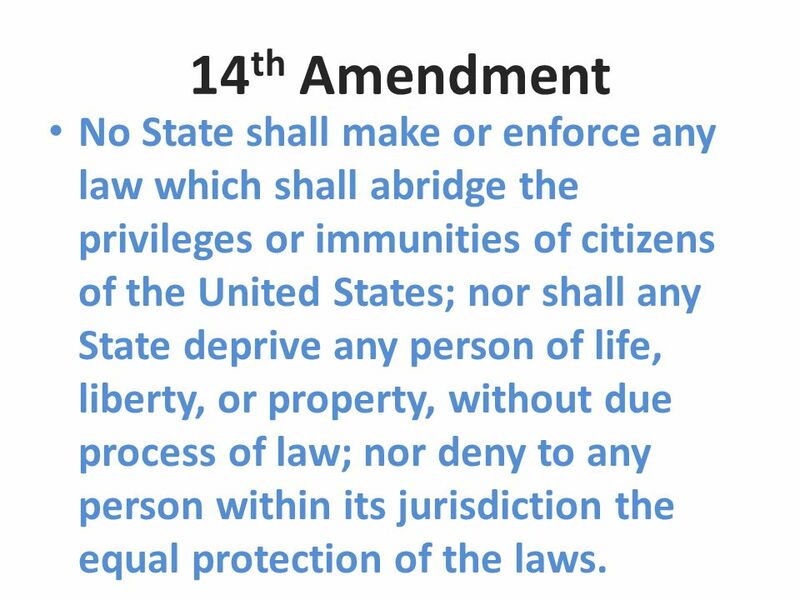 Equal Protection Clause 14 th Amendment of the Constitution (1868)  “no state shall make or enforce any law which shall. The Civil Rights Movement. Introduction to the Civil Rights Movement After the Civil War , the federal government made strides toward equality.